The RPM Traxxas 2WD Front Bulkhead for 1:10 scale Traxxas 2wd vehicles is the ultimate in design, strength and durability. RPM engineers reviewed the stock front bulkhead and found something curious. The stock front bulkhead does not sit flat, which can seriously affect suspension settings and adjustments! The RPM Front Bulkhead sits flawlessly level, meaning your front kick angle and A-arm angles will be perfect, providing a superior platform for precise suspension adjustments. RPM also cored out the bottom of the bulkhead. Why? First and foremost, it helps the bulkhead sit flat. Next, it significantly reduces the weight of the bulkhead. The RPM version is more that 15% lighter* than stock! By coring out the bottom of the bulkhead, it allows a convenient place to stick some modeling clay to adjust the weight bias of the truck. Leave the weight out if you want the front light; add it in if you want it heavier. RPM also included a handy dust plate to cover the bottom of the bulkhead on vehicles such as the Rustler, Stampede and Bandit that leave the bottom exposed. The dust plate prevents build-up of dirt and debris, which could affect the handling and weight of the truck. 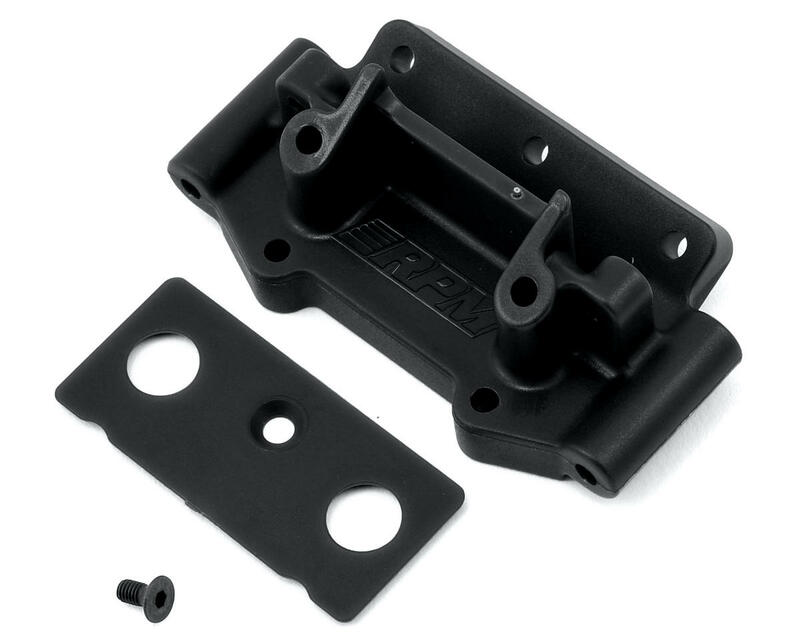 Each RPM Front Bulkhead is built from RPM's bulletproof blend of engineering grade nylons, made right here in the USA and comes with their limited lifetime warranty against breakage. If you want strength you can count on and engineering you can trust, look no further than RPM! 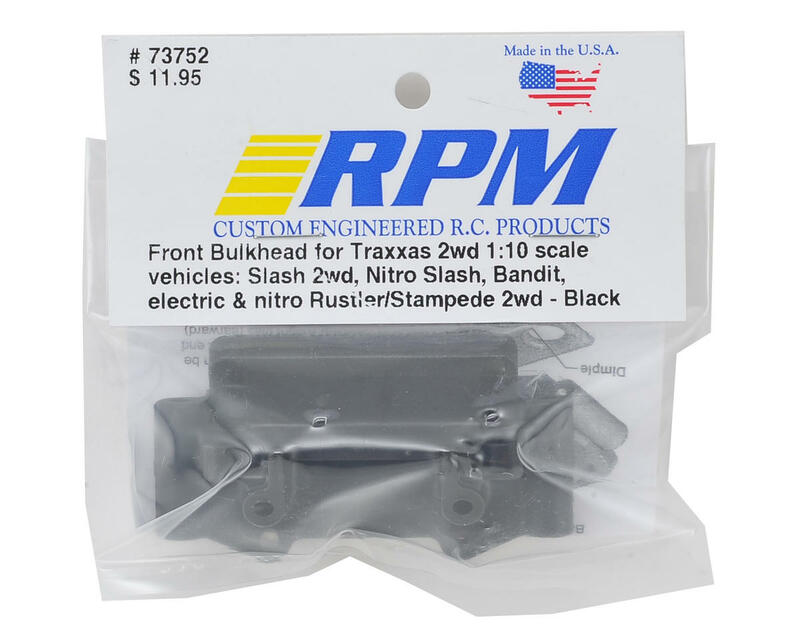 RPM Front Bulkheads for 2wd Traxxas 1:10 scale vehicles are stock replacement parts and replace stock Traxxas TRA2530 & TRA2530A. This bulkhead fits the following vehicles: Slash 2wd, Nitro Slash, Bandit, electric Rustler, nitro Rustler, nitro Stampede & electric Stampede 2wd (including its variants, the Skully and Craniac). It is not compatible with the 4×4 versions of any of these vehicles. Weight comparison is based off of the stock bulkhead versus the RPM Front Bulkhead without the dust plate installed. The RPM bulkhead fits like a glove and it feels so much more solid then the stock one. Putting the screw into the dust plate was real pain; you’ll need a full size screw driver to at least get it started but after that it’s not too bad (I installed the over just to keep dirt & junk out of it, I didn’t put any clay in). After that it was very easy to install. Since you have to take nearly everything off the front end it’s a perfect time to upgrade some other parts. So far this bulkhead has lived up to the RPM name and withstood all the trashing I’ve thrown at it. I highly recommend it.